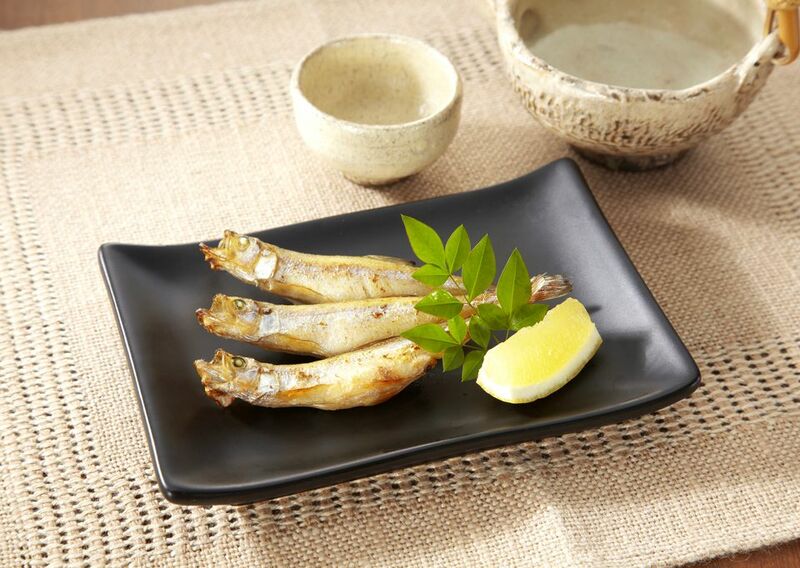 Grilled shishamo (smelt) is a popular Japanese dish where the entire fish, from head to tail, tiny bones and all, can be enjoyed as an appetizer, side dish or entree. Shishamo is a small salt water fish belonging to the Osmeridae family of small fish. It is a commonly eaten fish in Japanese cuisine that is simply grilled, and often found on the menu of izakaya (tapas) style Japanese restaurants. While the Japanese terms shishamo and komochi shishamo are used interchangeably on some restaurant menus, komochi shishamo specifically refers to smelt (shishamo) bearing many eggs (komochi). The roe of shishamo is typically whitish - yellow in color and is what makes komochi shishamo unique and delectable. In fact, the fish is so small that it has little meat, and you’ll find that the actual meat of the fish is almost fully comprised of the caviar. Perhaps it is this aspect of shishamo which makes this fish so unique. Given shishamo is such a small fish (those sold in the market average about seven inches in length), it’s thin soft bones and head is typically consumed together with the caviar and rest of the fish, including the tail! When the fish is grilled well, you’ll find the head and tail become crunchy and crisp, and it’s actually quite enjoyable. Although the entire fish can be consumed, this fish might not be for everyone, but as the saying goes, “don't knock it ’til you try it!” By far, shishamo is one of our favorite fish to cook and enjoy. Rinse shishamo gently with water. Pat dry with a paper towel. If it’s frozen, thaw the fish first, prior to grilling. Spray canola oil on a grill pan. Over medium-high heat, gently grill fish on each side about 4 to 5 minutes until browned. If you prefer the skin of the fish to be more on the crisp side, grill a few minutes longer to taste. When turning the fish over, be very careful as the fish are delicate and can easily break apart. The skin of the fish is also very thin and if it happens to break open slightly when cooking, it’s natural, and there’s no need to worry. Grate Japanese daikon radish and serve this on the side, seasoning the radish and fish with soy sauce to taste. Serve shishamo with grated Japanese daikon radish, soy sauce, steamed rice, miso soup and an easy spinach ohitashi salad for an elegant (and easy) Japanese meal. Shishamo is readily available for sale in Japanese markets and other Asian grocery stores and can be found in the refrigerated or frozen section of the market.